I won't bore you with a clever intro, we both know why you’re here. You want to figure out how much to charge your customers. It’s competitive out there so knowing the exact price to charge isn’t an advantage, but merely a must. It’s a starting point, not a differentiating point. What we’re covering here are just the basics, for mostly new businesses or businesses offering a new service. If you’re looking for tips on flat-rate pricing, raising prices or more advanced material, check out the links. Also, we’re not going to tell you an exact price to charge. Different markets affect pricing in different ways. We want to be a guide, helping you determine the price best for your business. And like most things in business, perfecting your price takes some time, a bit of calculating, and a lot of patience. Which makes me think of The Office episode where Michael starts his own paper company and low-balls the whole competition before finding he can’t run a business that charges such a low price. So, he ends up calling people who were already promised a low price, asking them to pay more. In the end, Dunder-Mifflin buys him out and everything is back to normal. Classic Michael. Whether your price is based on time (mins/hrs per property), size (property’s square-feet) or a combination of both - there are two main costs (on your end) to consider when determining a price. -Direct Cost: These are the costs that go directly towards completing the job at hand. -Overhead cost: These costs are necessary for your business to operate. They indirectly allow you to perform and complete each job (i.e. project) you have. The main thing you’ll want to figure out while researching competition pricing, is what you can’t charge. Meaning what price would be overcharging. Remember, for the most part, the market sets the price, not you. Here are two resources to help understand the market. Both offer the same functions like price averages based on zip-code and square-footage. As you try to understand the climate of your market you’ll likely come to realize certain customer values and expectations. This is where your pricing comes from. Don’t think about how you value your service. It’s not about what you would pay it’s about what your customer would pay. It’s important to understand that you’re not the customer, you wouldn’t pay someone to mow your lawn. So, whatever you would pay for lawn service is most likely lower than what your customer would pay. We’ve heard owners say “to the customer (especially residential), it doesn’t really matter the mower I have. If I have a $7,000 Toro Titan, I’ll have to charge roughly the same rate as the guy with a 10-year-old push mower.” Of course, if you charge by the hour or minute, a bigger, faster mower will result in a lower price. But when it comes to some smaller residential properties, the range of time doesn’t vary all that much. So when determining the equipment your business buys or uses it’s important to understand how this will and won't affect how much you charge. Essentially, what ROI comes with each equipment? Here’s a tool from our library that helps calculate the production rate of each equipment you have. 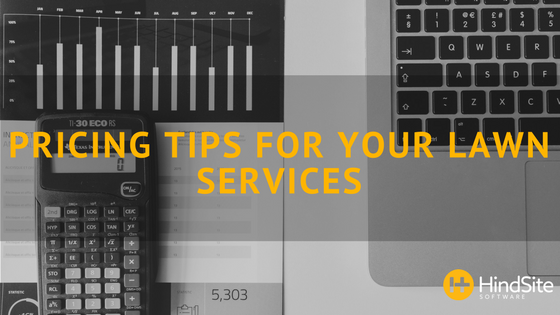 Knowing what to charge is merely the beginning - your quality of work, customer service and the overall efficiency of your business is what ultimately sets you a part from the competition.